The vase of baluster form with twin ornate acanthus handles rising from the shoulder; the whole resting on a single pedestal foot. 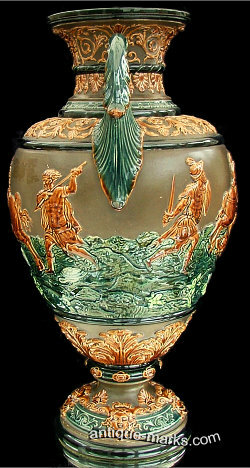 Superbly decorated with a continuous battle scene set in relief and depicting a horseman charging infantry then being brought down and killed. The underside rim and foot with bands of acanthus scrolls interspersed with gothic masks. Wonderful condition with one or two small rub marks and one sliver chip to the foot rim. Otherwise no chips, cracks, hairlines or restoration. There is a single clean hole to the foot stem where possibly a previous owner has attempted to turn the vase into a lamp. Bearing impressed Gerbing & Stephan script mark. Schiller & Gerbing was founded by two young apprentices who originally worked for Johann Eugen Philipp Leyhn. 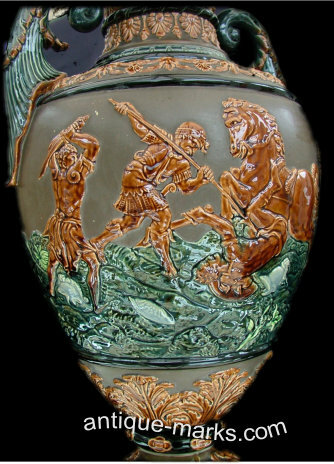 Wilhelm Leberecht Schiller and Friedrich Vincent Meinulph Gerbing founded their own small ceramics business in Bodenbach in 1829. 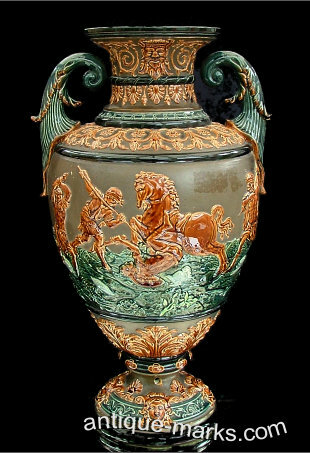 They began by producing pipe bowls for the much larger Rössler in Nixdorf, Bohemia, but the partners really focused on decorative art pottery using terracotta and majolica. They received their first award in 1831, a bronze medal at the industrial fair in Prague, and because of their success managed to secure contracts to supply English and American companies. In 1837, they left the industrial fair in Prague with a silver medal. In 1845, their continued success and monies awarded due to a dispute over material supplies helped them open a factory in Nieder-Ulgersdorf. The new Schiller & Gerbing factory was more independent, producing their own materials and much more ambitious offerings. The same year they opened the new factory, they entered the much larger industrial fair in Vienna and won the silver medal for design. The company expanded its production and eventually offered a full range of ornamental vases, centerpieces, clock casings, ewers, wall plaques, candlesticks, card trays, humidors, lamps, matchboxes, pitchers and beer steins. In 1848 Friedrich Gerbing died, leaving his shares in Schiller & Gerbing to his wife, Karoline Gerbing. Wilhelm Schiller and Karoline never got on that well, even though Karoline was to prove herself an astute business women. They parted company sometime in 1850 and Wilhelm Schiller setup a new company at Obergrund near Tetschen. Karoline Gerbing carried on alone but the business suffered financial difficulties because of family problems. In 1859, Karoline was visited by a Prussian businessman, Julius Reinhold Hermann Stephan. Julius Stephan initially proposed a joint business venture but eventually proposed to and married Karoline’s daughter Antonie Emelie Gerbing. Julius Stephan and Karoline Gerbings’ son, Friedrich Ludwig Gerbing, then renamed and rebuilt the Schiller & Gerbing company as Gerbing & Stephan. The brothers-in-law made a formidable team with business savvy Stephan focusing on financial matters and Friedrich Gerbing on production and design. The company continued to prosper growing in size and importance. In 1880 they entered the Christmas exhibition of the Austrian museum for industry and art in Vienna, where they won the silver award. 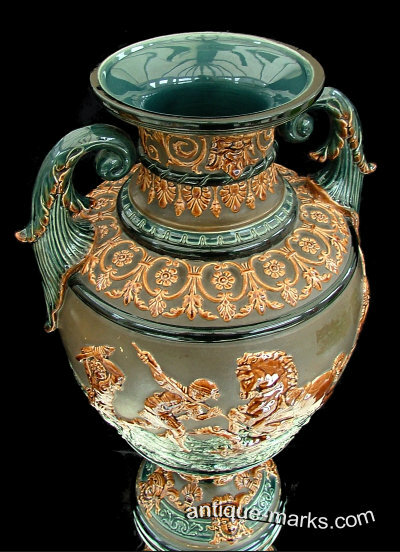 However the rise in popularity of the Art Nouveau style caught the company unawares and their focus on the production of historical Majolica lost favour. Gerbing & Stephan products quickly declined in popularity and the company’s financial position worsened. A lack of innovation and an inability to change quickly meant Gerbing & Stephan were unable to compete in the changing market. In 1903, Friedrich and Emil Gerbing closed the Gerbing & Stephan factory. In 1905, just two years later their father Friedrich Ludwig Gerbing died, he was 77. Schiller & Gerbing and Gerbing & Stephan Marks … The Gerbing related companies always marked their products with the letter combinations ‘S.& G.‘ or ‘G.& St.‘. 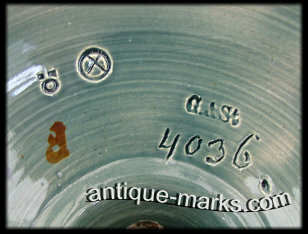 Some other antique makers marks include similar abbreviations but they are all by other companies that mostly existed before the Gerbing companies started.